Patriotism is a funny thing, and it really shouldn’t be. It's a personal interpretation, much like one's faith. Some people feel that supporting government, right or wrong, is what patriotism is all about, while others feel it is our duty as citizens to question the policies of our government. Either way, it is a sad truth that flag-waving has only in the past few years become popular again. As the recent patriotic fervor will attest, the people of our nation always appreciate having a rallying point. We remember The Alamo, The Maine, and Pearl Harbor. With those come people from whom we draw our strength, whom we look to for inspiration and strength, in our struggle. I would never condone a business for capitalizing on human suffering, but Marvel Comics has had a unique opportunity since Sept. 11, 2001 to provide such a rallying point. Until then, Captain America was just another in their stable of super-heroes. Endowed with super-human abilities by a government experiment, he represents the strength and courage of America; in a fictional setting he has the unique position to battle icons of repression. Captain America embodies the perfect American fighting man, a combination of John Wayne, Uncle Sam, and the boy next door, all wrapped up in the stars and stripes. For some of us on the home front, he represents that Army of One. Captain America led a wave of patriotic characters until the war’s end. Super-hero comics weren’t as popular, and like many soldiers, he faded away. 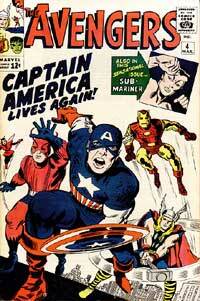 After a brief revival in the 1950s, In 1963, Marvel Comics revived the character in the pages of Avengers #4. It was 1963, and he was as youthful and strong as ever. Maybe it was a by-product of the super-soldier serum, maybe it was the result of being frozen for almost 20 years. Either way, he came at a time when America needed him most. As we entered the counter-culture movement of the 1960s, he took on new meaning. For some he represented The Establishment, The Man all hyped on waving the flag. But he also represented the disillusioned youth, disappointed by the unrealized promises of the previous generation, disappointment intensified by the Watergate scandal. While many of our classmates were under fire, either in Viet Nam or Kent State University, some of us realized America was not the nation that we had been led to believe in in our history classes. But it could be in the comics, where the good guys always won. In the years of relative peace, when the United States hasn’t asked so much of our fighting men and women, perhaps Captain America’s role has been to be the conterpoint to whatever political party was in office at the time. Despite this, he was never a pawn of the conservatives, or a mindless dupe of the liberals. Through it all, The Sentinal of Liberty stood tall and proud, fighting the good fight, defending our nation and its allies. But in the wake of 9/11, instead of being the embodiment of the American spirit, he has instead turned into an apologist for Yankee imperialism, suggesting that terrorism isn’t the threat, it is our response to terrorism that should be challenged. Captain America: What Price Glory, is an engaging story of love and betrayal worthy of the likes of Raymond Chandler. Steve Rude’s art evokes the spirit of Jack Kirby, as well as Jim Steranko. Written by Bruce Jones, it’s not a bad story, but it seems out of place. 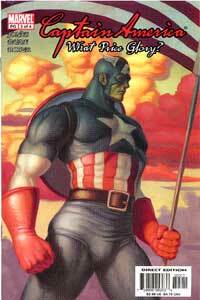 The iconic covers, reminiscent of classic illustrators such as N.C. Wyeth, depict Cap leading the forces of freedom, defending the flag. Instead, we were given a token reference to the World Trade Center tragedy that seemed tacked on at the last minute. I would expect a more thoughtful approach from a company with its headquarters in Manhattan. 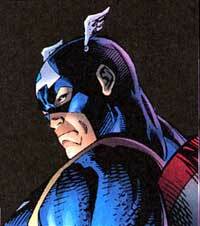 Cap still wears the colors of the flag, but they are currently as limp and impotent as Old Glory on a windless day. Captain America timidly suggests that the United States has grown beyond our days of Manifest Destiny. Perhaps we have, but we shouldn’t allow our own heroic icons become a tool for the anti-American conspiracy theorists with an ax to grind against our government. Perhaps we shouldn’t be surprised that Captain America has feet of clay in those red boots of his. While he currently battles New World Nazi’s in an alternate reality storyline, in the real world servicemen are returning on a regular basis from overseas. I would hate to diminish their genuine contribution by favoring a paper-thin fictional hero. America is in a time of trial, and it may very well get worse before it gets better. I have confidence that my nation will persevere...with or without Captain America.